So my suggestion is place the initial tile ON the windrose rather than below it. That should help getting the island more centered when the page first loads. Ideally the game would actually calculate the needed level of zoom & pan and ensure that the display loads with the island fully shown and centered, but that's perhaps asking a bit too much. I'd really appreciate even a very minor improvement. Last edited by volkerk on 11 December 2018, 20:23, edited 1 time in total. In your pictures the initial tile is actually centered on the windrose, which is not how you have implemented it! But what does that really have to do with it? The point of my request is to center the island that's being built in the display when loading the game. How you achieve that isn't my problem - I merely observed that it always loads with the windrose in the center, so I suggested to start the island there. You could just as well change the loading code to center the display differently, I don't care. But for usability reasons I'd like to be able to see the island when I load the game, instead of just seeing the upper rim and having to scroll 5-10 times with the 3-D controls before being able to do anything. Last edited by volkerk on 11 April 2019, 05:30, edited 1 time in total. 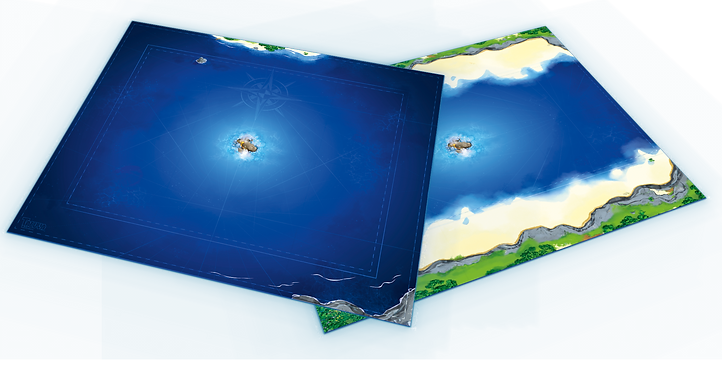 Also note that since players would have to rotate the island first in order to see the rear (partially hidden) parts of the island, they are far more likely to add to the island in the front and at the sides, exacerbating the issue of the island being off the center of the screen. That's why I suggested placing the first tile on the wind rose rather than below it - because you're in essence wasting half the "playing area". Anything I could do to explain myself better? The wind rose background image really has nothing to with this. Currently, on initial load the camera viewpoint is roughly centered on the first tile at zoom 100%. I think your request can be reworded like this: on initial load calculate the bounding box of the island and center the camera viewpoint in the middle of the played tiles at zoom 100%. quietmint wrote: The wind rose background image really has nothing to with this. Yes, exactly. That would be amazing. This is one of the reasons I stopped playing because I often take turns on my phone and using the 3d feature makes moving the screen very hard. It's really really hard at the end of the game because the 3d causes the device to get bogged down. Yes, that would be a perfect solution. Thanks for listening! And I want to be clear that I love the game already, but with this improvement it would be even more fantastic - and a lot more user-friendly.